The CST Sandd Bafang Mountain Bike Racing Team is a UCI Elite Mountainbike Trade Team, that is ranked among the top 5 of the world’s best professional teams. 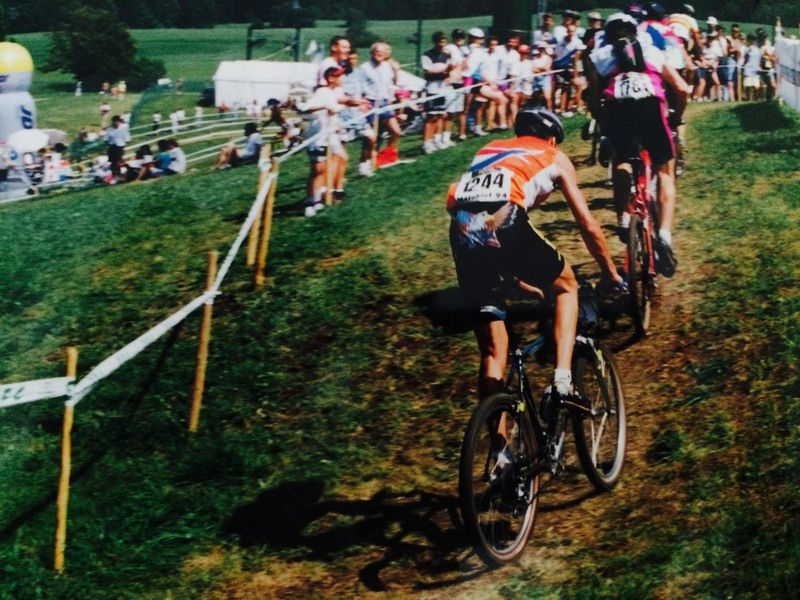 The founder, owner and team manager is Bart Brentjens, an icon in the sport of mountain biking, and the first ever Olympic Mountain Bike Champion at the 1996 Olympic Games in Atlanta. The team consists of five riders from all over the globe that ride in a few different categories; Sebastian Fini Carstensen (DEN) and Martins Blums (LAT) compete in the Elite Men category, Yana Belomoina (UKR) and Anne Tauber in the Elite Women category and youngster David Nordemann (NED) in the U23 Men category. The ultimate goal of the Team is to win a medal at the 2020 Olympic Games in Tokyo. In addition to this objective, the Team also aspires to consistent top 10 results in the UCI World Cup series, to maintain its top 15 world ranking, to build a strong brand that will provide maximum exposure for its partners, and finally, to share in the “Get active and have fun while respecting nature” attitude. The mountain bike was born in the United States, specifically in the Golden State of California, on Mount Tamalpais in Marin County, located just north of the Golden Gate Bridge. The first prototypes of its kind were built in the late 1960s and by the early 70s, mountain-bike races started to pop-up among the fast-growing number of enthusiasts of this new sensation. It did, however, take a while before the mountain bike found its way to Europe. In response to the mountain bike’s rapidly-increasing popularity, the Dutch company Veltec-Rentmeester, and its US subsidiary, (Veltec USA), introduced American Eagle Mountainbikes to the market in 1993. Veltec-Rentmeester did some tests with off-road bikes under the famous road cycling brand Concorde, but the introduction of American Eagle allowed them to complete their range of bicycles by offering a genuine mountain bike! American Eagle frames were initially built with steel, but their construction eventually turned to aluminum, a significantly lighter material. American Eagle bicycles were easily recognizable thanks to their sophisticated geometry and strikingly long top tube. They were available in a variety of models, from the lower end, perfect for beginners, to the fully competition-ready mountain bikes such as those used by their professional international factory MTB team. A few that were particularly popular were the “Death Valley”, “Durango” and “Vail-S”. The most famous American Eagle is clearly, the “Atlanta”, on which Bart Brentjens became World’s First Olympic Mountain Bike Champion at the 1996 Olympic Games in Atlanta, Georgia, USA. American Eagle consumers were genuinely pleased with their bikes and spoke well of them as they were lightweight, high-quality and seemed virtually indestructible. And many, over the years, have had a hard time saying good-bye to their prized American Eagle bicycles. Because of the growing and competitive market, and new high-tech materials such as carbon, it seemed as though American Eagle had flown too long and had to land at the beginning of this century. However, in 2017, the famous brand, with an international reputation, spreads its wings to fly again. 20 Years after becoming the First Olympic Mountain Bike Champion, Dutchmen Bart Brentjens and Henk Schipper have joined forces to breathe life back into the mythical American Eagle brand. * During the Summer Roel Paulissen (Belgium) and in the autumn Gunn-Ritha Dahle (Norway) and Elsbeth Vink (Netherlands) joined the Team. Since the 1996 Olympic Games in Atlanta, American Eagle has systematically been linked to the success of Bart Brentjens and his Olympic Gold, making the Dutchman’s name synonymous with victory on an international scale. After winning the UCI World Cup Series in 1994, and becoming the MTB World Champion the following year in Kirchzarten Germany, Bart Brentjens rode his American Eagle into history by winning the 1st Mountain Bike Olympic Gold Medal at the 1996 Olympic Games in Atlanta USA. This triumph is not only the true highlight of Bart’s career, but also that of the American Eagle brand. Team American Eagle harvested an enormous amount of victories in the relatively short period that it ran a factory sponsored mountain-bike team. In 1994, Team American Eagle was managed by Jan Ten Tusscher, and the jersey was proudly worn on the back of the powerful newcomer, Marcel Gerritsen (NED), silver medal winner at the 1993 Mountain Bike World Championships. In the years that followed, it was Bart Brentjens who made it to the top of international mountain biking by climbing onto several UCI World Cup podiums, including the top step at the UCI World Cup in Cairns, Australia, making Brentjens the overall leader of the most prestigious mountain biking series. By winning the bronze medal at the World Championships in Vail, Colorado, USA that same year, Brentjens brought his season to a successful close. 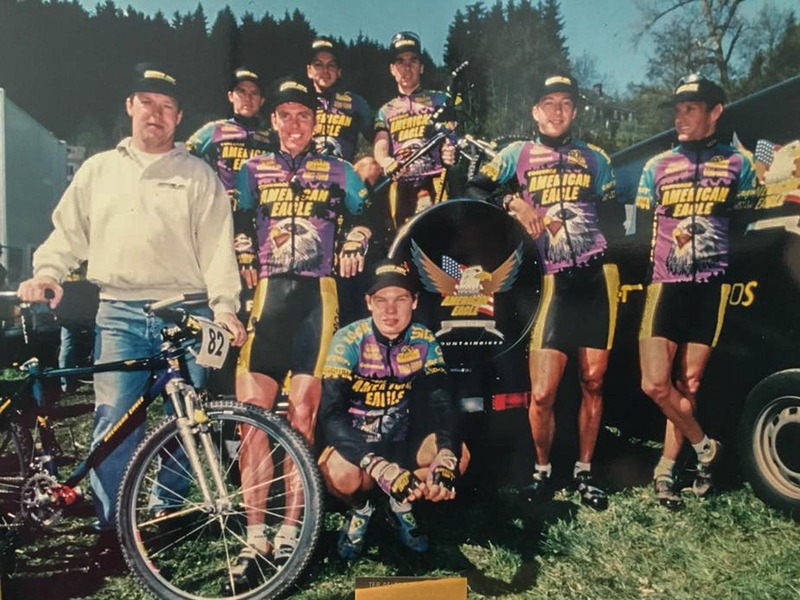 Other well-known road and cyclo-cross riders, such as Adrie van der Poel, 4th in the 1994 Houffalize (BEL) UCI World Cup, and Richard Groenendaal, bronze medal winner at the 1995 Dutch Mountain Bike Championships, were also part of Team American Eagle. Mountain Biking was steadily growing in popularity and importance to the UCI and the rest of the international cycling world. Because of this, the organizers of the Tour de France had a vision, and in 1995, the first official Tour VTT (Tour de France for mountain bikers) became a reality. The American Eagle Mountain Bike Team was present and achieved a remarkable double victory in both the men’s and women’s category for two consecutive years; Bart Brentjens for the men in 1995 and 1996, and for the women, the German guest-rider Hedda zu Putlitz in 1995 and the Norwegian, American Eagle team member Gunn-Rita Dahle in 1996. American Eagle also kept an eye out for young mountain biking talent. The gifted Dutchman Gerben de Knegt and Flemish Roel Paulissen were given the chance to develop their expertise as part of the American Eagle Mountain Bike Team. Paulissen not only won the Belgian Championships while riding for American Eagle, but also the bronze medal at the World Championships in the U23 category. American Eagle allowed Paulissen to lay the foundations for a brilliant career in mountain biking. 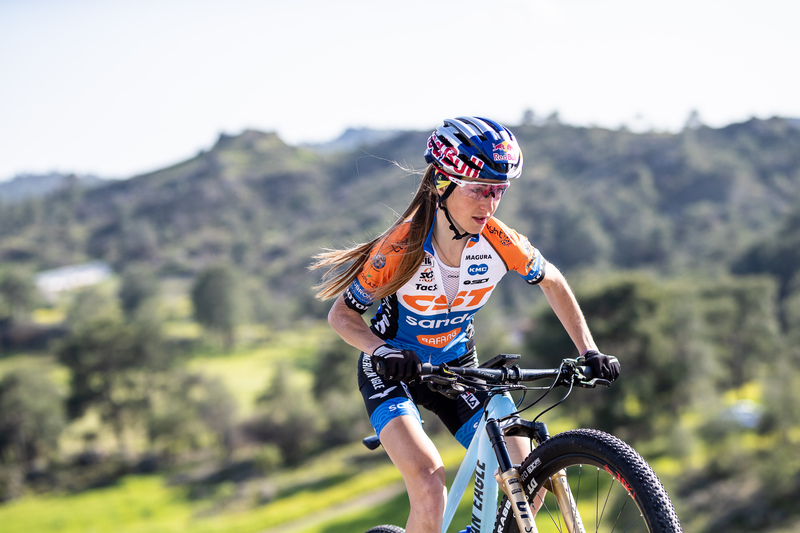 What sets the modern sport of mountain biking apart is the lack of discrimination between male and female team members, and the two are usually equally represented on each professional team. Young talented female riders such as Elsbeth Vink (NED) and Gunn-rita Dahle (NOR) joined Team American Eagle in 1995. When discussing the 1996 Atlanta Olympic Games, Bart Brentjens’ Gold Medal will always stand out, but it is important to state that the female members of Team American Eagle were also very successful, Gunn-Rita Dahle (NOR) and Elsbeth Vink (NED) finished 4th and 5th respectively in the same Games. When Brentjens left Team American Eagle at the end of 1996, the strong and well-known Norwegian rider Gunn-Rita Dahle became responsible for American Eagle’s new success thanks to her many victories, which included 4 UCI Mountain Bike World Cup events. In 1996, she finished 2nd place overall in the UCI World Cup Series, and 4th in the same series in 1998, but also claimed silver at the MTB World Championships while riding for American Eagle. Meanwhile, the Dane and three-time World Champion Hendrik Djernis continued to collect some impressive results including the bronze medal at the 1997 World Championships. After Jan Ten Tusscher and Simon Burney had their turn as team managers, Ruud Poels took over the reins. It was the UK rider Caroline Alexander that gave Team American Eagle its top results in 1999 when the former British Champion rode a solid UCI MTB World Cup Series finishing 5th overall. Unfortunately, this was the last year that American Eagle had their own international factory team. But it is interesting to note that the current UCI mountain bike coordinator, Peter van den Abeele, and the still very competitive Sabine Spitz (2008 MTB Olympic Champion) were part of Team American Eagle that same year. 2000 was the “last” year that the American Eagle logo was visible on a team mountain-bike jersey, and the same year that Jan ten Tusscher, the Dutch National Team manager at the time, was in charge of such talented countrymen as Ruud van Mill, Martijn Hofstede, Johan van de Ven and Maarten Nijland.